A remarkable collection of 22 match-worn shirts from the inaugural season of the F.A. Premier League will go under the hammer at Bonhams Sporting Memorabilia sale on 26th September, in Chester. The collection is estimated at £30,000 – 35,000 and each shirt is framed with printed details of the player. The shirts have come to auction, as the new season opens, through former Queens Park Rangers chairman, Peter Ellis, who collected them during the very first season of the Premier League, between 15th August 1992 and 11th May 1993. With a long-standing passion for football, the chairman acquired the shirts throughout the season to display in his home and to remember the important moment in history. 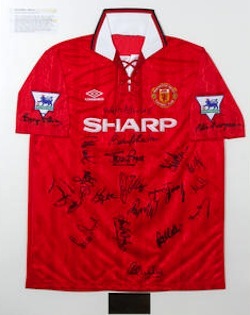 The collection includes shirts worn by former football legends Bryan Robson, captain of Manchester United, the League champions in the 1992–93 season; Peter Reid, manager of Manchester City; Ian Rush, top Liverpool striker; Gordon Strachan, Leeds United ‘Player of the Year’ and Andy Townsend, Chelsea midfielder, now equally famous for his sports commentary. Each shirt, one from every club competing in the first season, is hand signed by the squad. The Premier League was established in August 1992, with 22 clubs that broke away from the Football League at the end of the 1991-92 season. The first goal of the competition was scored by Sheffield United’s Brian Deane, whose red and white striped shirt is also included as part of the collection for sale. Over the course of the season an impressive 9.75 million people attended the matches, with Manchester United winning the first League title. Bryan Robson, captain of Manchester United at the time, wore a red Umbro short sleeved shirt, one of the highlights of the collection, which has been signed by around 18 team members and officials, including manager Alex Ferguson and former chairman Martin Edwards.